If you are like most people, you know when you see a pretty flower and you even know the names of many of your favorites like rose, peony, or carnation. But you are not an expert in arranging flowers or using them to create a mood or ambiance. That is why it is a prudent move to hire a florist for your wedding. There is no shortage of wedding florists in the Atlanta area, but there are a limited number of florists who will be able to bring your vision to life for your wedding. There are some questions you absolutely must have answered if you are to set the right tone with your flower designs on your wedding day. You start by asking about your date and whether the potential florist will be working any other events on the day of your wedding. A key component of being a wedding florist is knowing the ceremony and reception venues. Ask them if they have ever worked your chosen venues before. If they have, talk about their experience and vision for the sites and if they have not, find out if they are available for a site walk through to avoid any potential pitfalls. If they are willing to do this and they should be, find out if they charge extra for it. You will want to know if they themselves will be doing your arrangements or will it be an assistant or even outsourced. Before you get too deep into conversation with your potential florist, as them a range of what their wedding arrangements usually cost. If the numbers they give you are far above the budget number you had in mind, ask them if they are willing to work within your budget. There are some really creative florists who can make some excellent recommendations that will save you a lot of money. It is worth asking about. This is the time to ask about packages they offer. If a package doesn't include an option you really like, see if you can negotiate this option into the package. It all depends, but our philosophy is nothing ventured, nothing gained. Of course, you always want to find out the normal information like experience, number of wedding done, and how they would describe their style. If you like their style and your budget is within range, ask to see some drawings of what they can do for you. If you saw a picture of something you really like, would they be able to recreate it. One thing many people don't think to ask about is other design elements. Ask them if they provide other accents like trees, votives, mirrors, and candelabras. Also, so you won't be caught off guard when the bill comes in, ask if these elements are rented or are you buying them. Find out about payment options. Do you have to put a certain percentage down to reserve the florist and are there any hidden fees that haven't been brought up yet. When is the final payment due? Also, ask about their refund policy, its better to be safe than sorry. There are a lot of little details that you will want to be aware of like how long does it take to setup and teardown. 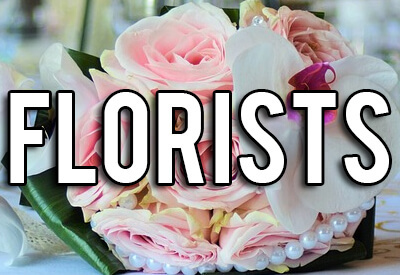 When you are completely satisfied by the answers and the price, go ahead and book your wedding florist.